Rabbit And Ghosts [C6164] - $9.00 : Yarn Tree, Your wholesale source for cross stitch supplies. Cross stitch pattern by Fairy Wool in the Wood. 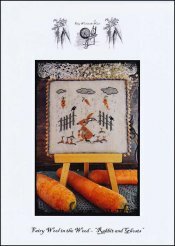 This rabbit themed sampler features a rabbit picking carrots accented by a fence and clouds. Stitch count 76w x 71h. Stitched on #4178 Belfast Linen country mocha.